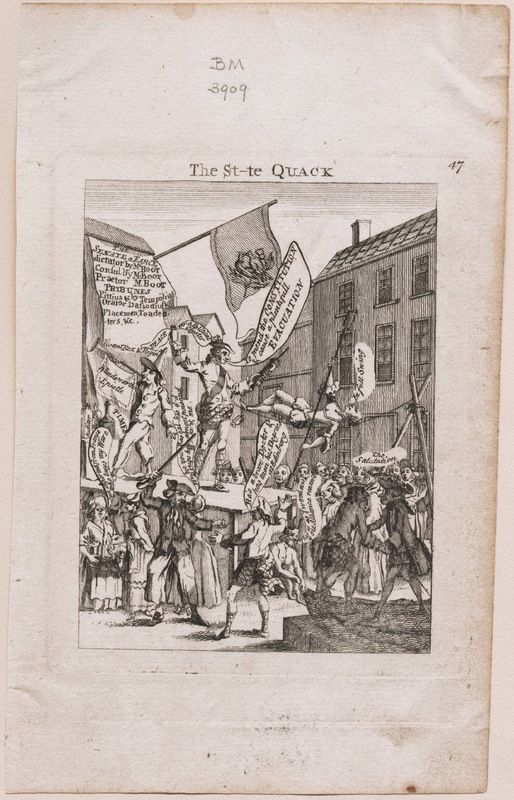 "The St-te Quack," E. Sumpter, 1763, Lewis Walpole Library. In the midst of this chaotic political cartoon, Jack Tar raises his stick to strike at a Jacobite. While I confess myself ignorant of the subject matter this cartoon deals with, there is a hint in the words of our intrepid sailor: "his d-d Drugs have almost poisond H-ke & me." This is certainly referring to Admiral Edward Hawke, who proved himself in the naval operations of the French and Indian War. Wearing his cocked hat backward (or point forward, depending on your perspective) this tarpawlin hold his stick over his head, ready to strike a blow. His short hair is curled like a bob wig, and a light colored, plain neckcloth hangs down over his single breasted jacket. With slit pockets at the waist and slit cuffs, the jacket ends just above the top of his thigh. Loose and baggy trousers end above his ankles, revealing white stockings and pointed toe shoes with tall heels and rectangular buckles.